It's finally here. 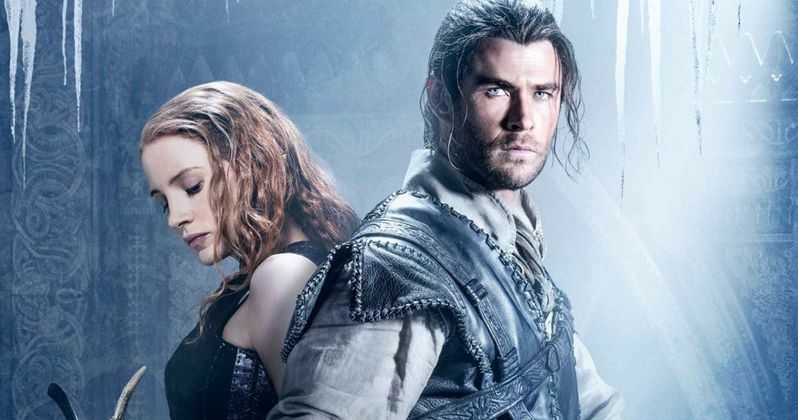 Universal Pictures has released the first trailer for The Huntsman: Winter's War. Chris Hemsworth returns as the Huntsman Eric as he takes on a new evil. This sequel to 2012's Snow White and the Huntsman will give us new insight into Eric and how he came to be such a great hunter. And it will introduce his new ally, played by Jessica Chastain. This thrilling adventure also teams up Charlize Theron's Queen Ravenna with Emily Blunt as a cold queen who is sure to give Frozen's Elsa a run for her money. Long before the evil Queen Ravenna was thought vanquished by Snow White's blade, she watched silently as her sister, Freya, suffered a heartbreaking betrayal and fled their kingdom. With Freya's ability to freeze any enemy, the young ice queen has spent decades in a remote wintry palace raising a legion of deadly huntsmen, including Eric and warrior Sara. Only now she has found that her prized two have defied her one demand: Forever harden your hearts to love. When Freya learns of her sister's demise, she summons her remaining soldiers to bring the Magic Mirror home to the only sorceress left who can harness its power. But once she discovers Ravenna can be resurrected from its golden depths, the wicked sisters threaten this enchanted land with twice the darkest force it's ever seen. Now, their amassing army shall prove undefeatable...unless the banished huntsmen who broke their queen's cardinal rule can fight their way back to one another. Chris Hemsworth is reprising his title role as The Huntsman Eric in this thrilling fantasy. A first look at his return arrived yesterday with 4 new character posters. Also featured on these one-sheets were Charlize Theron, who is once again playing the beautiful yet evil Queen Ravenna, and her sister The Ice Queen, played by Emily Blunt. Jessica Chastain is The Warrior Sara. In The Huntsman: Winter's War, it will be revealed that Eric and Ravenna's destinies are deeply and dangerously intertwined. Cedric Nicolas-Troyan makes his directorial debut with The Huntsman: Winter's War. But it's not the first time he's wondered through these woods. The man served as the VFX supervisor for Snow White and the Huntsman. And the film is in the hands of producer Joe Roth, who is responsible for Maleficent and Alice in Wonderland. Check out the first exciting trailer right now!